Later in the summer, it may be possible to drive further along this road, possibly to the place called Sålell. This will make the climb considerably shorter. Route description: See the description for Kvitingskjølen. From the summit of Kvitingskjølen (2064), ski down to the broad, connecting ridge. The key saddle is quite close to the west summit. Ascend the slope on the south (left) side then curve north (right) and gain the summit. Note that this summit has an overhanging cornice facing east. 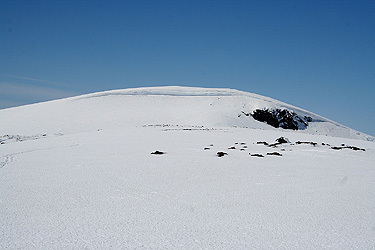 From this summit one may ski directly down towards the lower part of the valley Kvitingsgjelet, then return back to the trailhead. 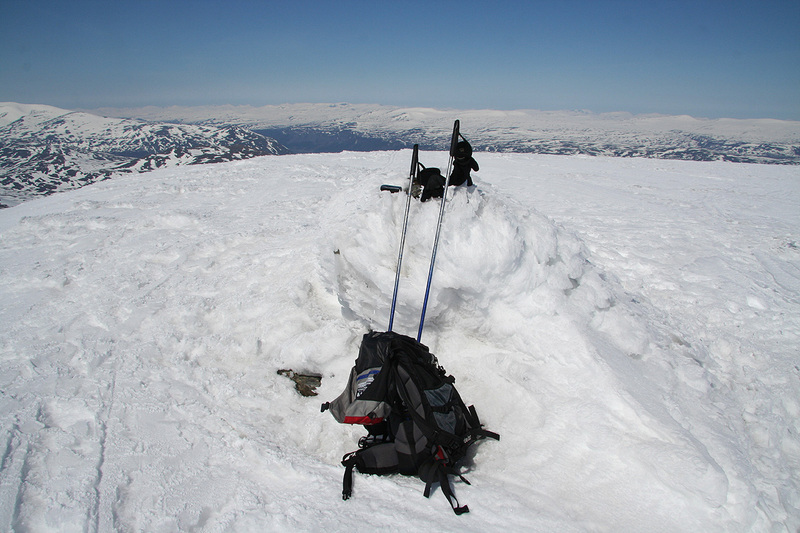 Comments: I arrived at this summit around 1235, about 20 minutes after leaving the (main) Kvitingskjølen summit. I subsequently had a very nice downhill ski on near perfect crust all the way back to the lower end of the Kvitingsgjelet valley. I left this summit at 1245 and arrived back at 1100 meter where the skiing ended in 45 minutes. Thirty nice minutes of hiking downhill on the road brought me back to the car by 1400. This trip to Trondheim (Para08), now continued to Oppdal and Gjevilvasshytta where I checked in to the self-serve unit. The next goal was to climb Blåhøa.